Everything is going really great. We are the 24th seed, and if we win our next game we will get paired against Loranger to play for district champs. I want to play Loranger because one of their players already committed to LSU, and he and I will be a good matchup. Loranger is ranked No. 1, so I want to beat them. Morris Claiborne because I think he is the best player, and he is so humble. I started playing when I was 5 years old. I played in New Orleans for a local neighborhood park team. It’s the same team that Tyrann Mathieu played on. No ma’am, but my second cousin Chris Briggs plays wide receiver at Southern Miss. 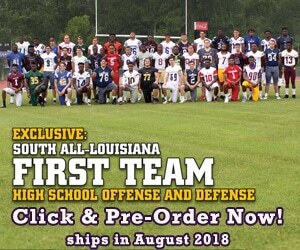 I went to the LSU high school football camp in July. I am definitely more of a fast guy because I can catch up to anyone, but I can’t break out quick at first. My favorite position is really cornerback, but I play all over. I am being recruited for cornerback and safety because I play those positions a lot.